Chop kaddu to small pieces. Add a table spoon of salt to it. (Usually the preparation of this papad is done a night before making, as they have to be made next day morning) Wrap the chopped pieces in a cotton cloth. Keep it in a strainer and place another vessel under it. Now place a heavy weight on it. (you can place grinding stone) ..... Wash and soak urad dal over night. The next day grind the urad dal to fine but thick paste. Remove the chopped kaddu pieces and spread them on a kitchen towel. Leave it for at least 15 to 20 mins. Throw away the strained juices collected in the bottom vessel. Chop onions and green chillies (green chilli paste) finely and add them to the batter. 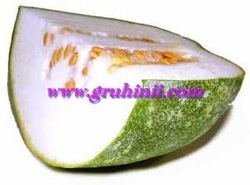 Also add the ash gourd pieces and salt to taste, jeera and hing and mix well. Now take a plastic sheet or any cotton Saree and place it on the floor in the sunlight. 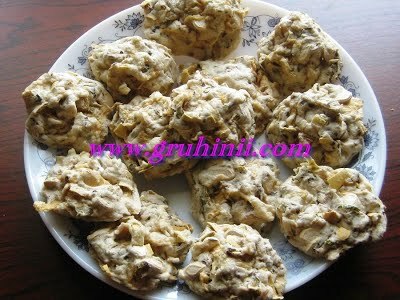 (usually these are made in Summer season ) Take a spoon full of batter (either with a spoon or with your fingers) and start placing them on the cloth/plastic sheet. Maintain equal distance in between. Do until the batter is over.